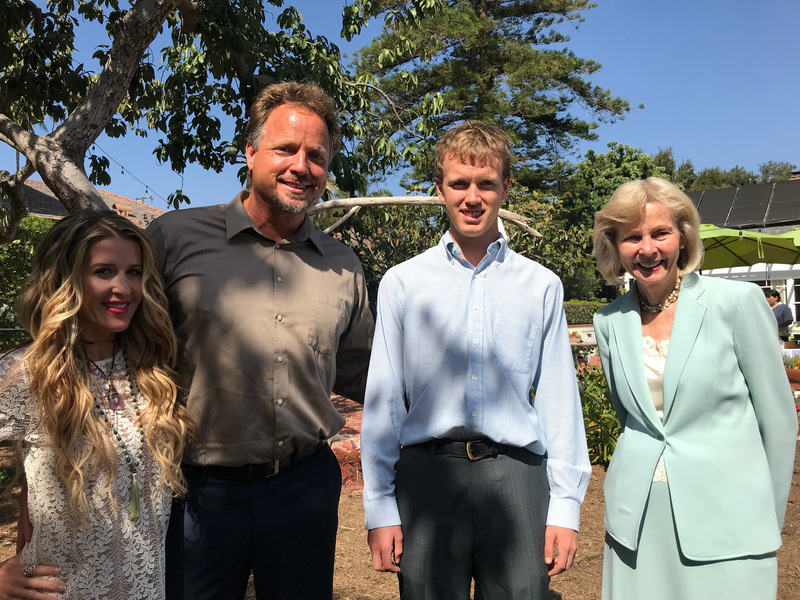 Lois Capps (right) and son Todd Capps (second from left, standing between wife Rebecca Capps and his son, Aden) have formed the Lois and Walter Capps Project to foster civil dialogue amid a bitter national climate. For Todd, the root of the project stems from a desire to spark civil conversations between people who disagree. He said he doesn’t believe in the “illusion” that his project will suddenly make people with different ideologies agree on everything, but he thinks finding common ground is a reasonable goal. “We can disagree constructively and respectfully,” Todd said. The idea of a new nonprofit sprang up a few months ago, Todd said, and the first lecture was by Marianne Williamson, the author of myriad spiritual self-help books anda longtime friend of the Cappses. During her hour-long talk at the Marjorie Luke Theatre, Williamson drove at the idea that things will get better with the activism that begins in the community. “We can be educated; we can be noble; we can be intelligent; we can be wise,” she said at one point. “We can speak from that place and act from that place. And as we do, we will find ourselves in collaboration with others doing the same. That is how you get of darkness; you simply turn on the light.” The audience responded to her talk with applause and “amen”s. At a gathering in the Capps backyard after the talk, Todd spoke about his role as director of the project. The huppah used for his wedding a couple of weeks ago was still up. He was wearing a cast on his left arm after a freak accident: Someone had slammed their car into reverse, landing against Todd and breaking his thumb. Amicable and spirited, Capps said he believes friendship is something that can overcome political spite, and he reminisced on sharing beers with a friend he politically disagrees with but with whom he still shares a relationship. The project will be nonpartisan, meaning it will not endorse candidates or drive at a specific political agenda, he said. Lois Capps recounted how during her tenure in Congress, she would work to find a Republican coauthor of any bill she introduced. But things took a turn, she said, when the Tea Party movement gained steam. She could no longer find Republican colleagues for her bills. “It was sort of an unwritten rule,” she said. Both Cappses also expressed frustration with the nation’s media literacy, placing blame on the media’s rush of partisan coverage and the readers’ speedy consumption of headlines in lieu of full stories. The solution to this for Lois and Todd Capps lies in community development. One of the programs that the project will launch this year will be called Democracy Arts, with the goal to merge music and art shows with dialogue on key issues, Todd said. For next year, a partnership with Human Rights Watch is planned. The project’s current partners include UCSB Associated Students, the Granada Theatre, Santa Barbara City College Foundation, and La Casa de Maria. The Walter H. Capps Center at UCSB, which sponsors internships, course credits, and lectures at the university, will coincide with the project’s focus on community development, Lois said. Walter Capps gained recognition with his UCSB classes in the 1970s that featured Vietnam veterans as guest lecturers. He was elected to Congress in 1996 but died of a heart attack nine months into his term. His wife, Lois, won a special election to fill his seat, and served 19 years in the House. A former school nurse, her focus has included environmental issues, health care, and education. She was succeeded in 2017 by Salud Carbajal.